Will be supported by Fiire (LMCE support). •	Fits in a standard A/V rack, on an existing shelf or with a custom sliding rack-mount shelf for easy access in standard 19" rack systems. •	Software: LinuxMCE 0710. Will self-upgrade as new releases come out. •	RAID storage for media: 12port sata controller + 12 sata bays (hard drives aren’t included). •	Network: Dual Ethernet ports. Gigabit speed. LinuxMCE supports 3 variations of the user interface, as shown here. The Fiire Stations are designed to be LinuxMCE media stations, and use special graphics processors and video decoders to provide the highest quality video playback, and provide alpha blending done in the hardware. However, the video subsystem in the Fiire Station is not available for use in a standard PC platform. The Fiire Engine, however, uses standard PC parts. The Fiire Engine is intended to be primarily the back-end server, while the Fiire Stations are dedicated for media playback. Therefore the Fiire Stations have more a/v connections, including component video, and SPDIF coax and optical for digital audio and surround sound. 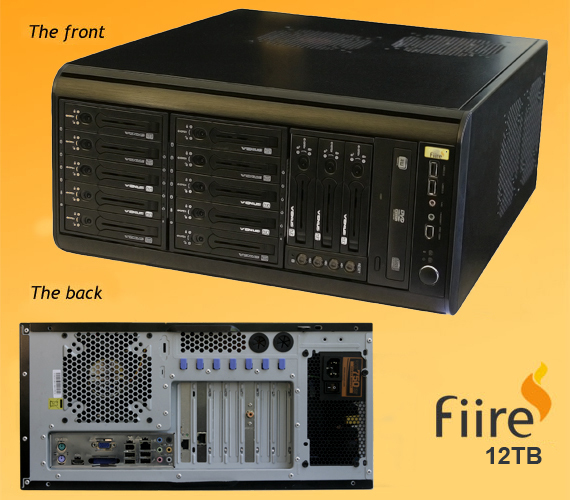 The FiireEngine 12 TB is the main brain of our LinuxMCE solution. This is what runs all the back-end software, provides diskless boot images to the FiireStations, runs your RAID storage, phone system, home control, and so on. You need one and only one FiireEngine for the whole house. In every other room where you want LinuxMCE you add the FiireStation thin clients. The FiireEngine is built with PC components and the latest generation INTEL core 2 duo CPU. This gives the FiireEngine the processing power it needs to handle all the back-end tasks. The FiireEngine can be connected to a TV and used as a home theater PC. But, generally speaking we find most people don't want a PC connected to the TV because even with high-end fanless systems the hard drives are still audible, the PC's are big and require a shelf or rack to put them on, sa, we designed Fiire with the intention that in higher-end installations the FiireEngine would be put in a central closet out of the way and the FiireStations would be connected to the TV's. Since all devices throughout the home are shared, and every FiireStation has access to all the media and devices connected to the FiireEngine or to other FiireStations using a standard home network, there is no reason why you need to put the FiireEngine in close proximity to a TV. The FiireStations boot off the network using the FiireEngine's hard drives. The FiireStations are quiet, use very little power and generate little heat. They have specialized video processors to deliver video-phile quality high-def playback and de-interlacing of 1080i. To get started you can buy a FiireEngine by itself, which you conect to a TV and use as a HTPC, and then add FiireStations later when you want to add extra media directors. This page was last modified on 28 September 2015, at 00:02.